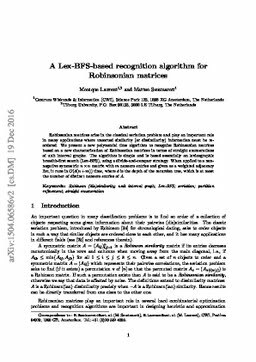 Robinsonian matrices arise in the classical seriation problem and play an important role in many applications where unsorted similarity (or dissimilarity) information must be reordered. We present a new polynomial time algorithm to recognize Robinsonian matrices based on a new characterization of Robinsonian matrices in terms of straight enumerations of unit interval graphs. The algorithm is simple and is based essentially on lexicographic breadth-first search (Lex-BFS), using a divide-and-conquer strategy. When applied to a nonnegative symmetric n×n matrix with m nonzero entries and given as a weighted adjacency list, it runs in O(d(n+m)) time, where d is the depth of the recursion tree, which is at most the number of distinct nonzero entries of A.